Thinkbaby’s signature bright orange may not be going anywhere soon, but color enthusiasts who prefer variation can welcome a new hue to their tables. The company’s infant-feeding sets now come in a punchy deep blue. More choice lies ahead: you can buy the entire kit or go a la carte with the bento box, cup, or soup bowl. I just discovered these at a store today and bought the soup/cereal bowl. I was not a fan of Think's orange. I love the size and that the food doesn't have to touch plastic. Better yet the plastic outside easily slides off the inner metal liner and now I have 2 bowls! The plastic outer one though has a tiny air vent/ hole so it won't hold liquids without the metal liner. I tested the lid on this bowl and it leaked so I wouldn't really use it to take liquids on the go. The best thing I've found for on the go are Lunchsense #5 plastic containers by Lock & Lock which have compartmentalized trays inside bento-style to separate foods. 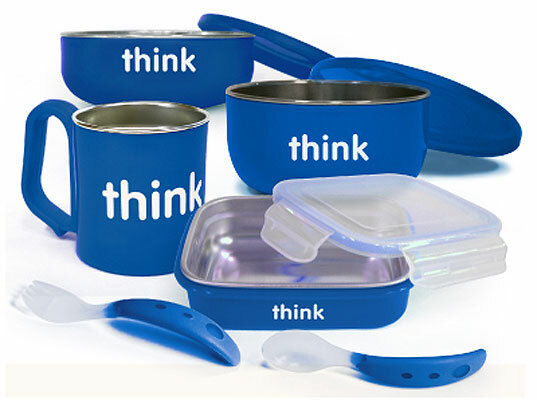 These are also free of phthalates, bpa, and pvc and are watertight. I've actually found these Lock & Lock containers in a huge array of shapes, sizes, and configurations of compartmentalized trays at local Japanese/Chinese stores in my city. Thinkbaby's signature bright orange may not be going anywhere soon, but color enthusiasts who prefer variation can welcome a new hue to their tables. The company's infant-feeding sets now come in a punchy deep blue. More choice lies ahead: you can buy the entire kit or go a la carte with the bento box, cup, or soup bowl.